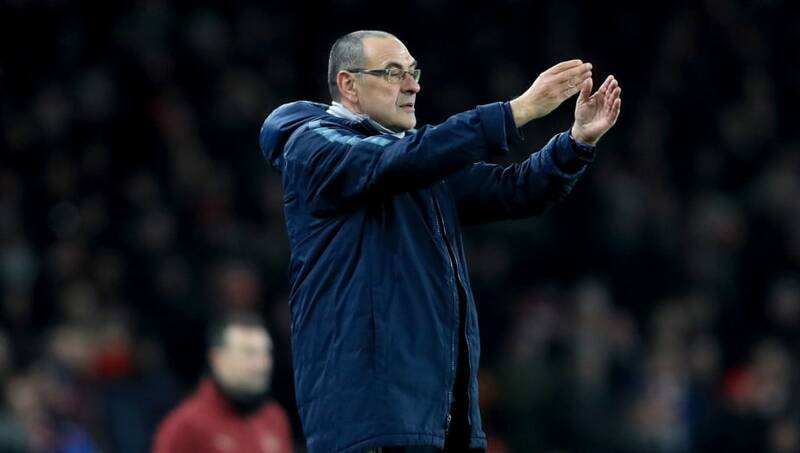 Maurizio Sarri questioned the attitude of his players after Chelsea were beaten 2-0 by rivals Arsenal at the Emirates Stadium. Arsenal came out of the blocks firing, and Alexander Lacazette gave the hosts an early lead thanks to a fantastic individual effort. Chelsea began to see more of the possession, however couldn't find a way past the Gunners' backline, and found themselves 2-0 down by halftime. Laurent Koscielny found himself unmarked in the middle of the area and got on the end of a Sokratis cross, with the ball coming off his shoulder and looping into the far corner to double his side's lead. The second half followed a similar pattern to that of the first, with ​Arsenal creating the better chances and looking more likely to add to their lead. ​Chelsea had no answer and struggled to create any clear-cut chances as Arsenal cruised to a convincing ​2-0 win. Speaking to Chelsea's ​official website after the game, Sarri admitted he was furious at the performance and conceded that Arsenal were more determined on the night. He said: "I am extremely angry. "Very angry indeed because this defeat was due to our mentality more than anything else, our mental approach because we played against a team that was far more determined mentally than we were and this is something I can’t accept. We had a similar issue in the league game at Tottenham, we spoke a great deal about that particular loss and our approach at the time. "I thought we had managed to overcome this issue but it seems we have the issue with having a sufficient amount of determination, being mentally solid, so I am not happy because I prefer to come into the press conference and to speak to the players and talk about tactics and why we lost from a tactical and strategy point of view, but the fact of the matter is it appears this group of players is extremely difficult to motivate." The loss means Chelsea's six point lead over Arsenal in the ​Premier League table prior to kick off has now been cut to three points, with their place in the top four now severely under threat. When asked how the players can change their mentality, Sarri went on to add that they need to be more aggressive at both ends of the pitch. He added: "It is a difficult question to answer, it seems to me that as a group of players they are not particularly aggressive from a mental point of view, they don’t have that ferocity in their mentality and that is down to the type of players they are, their characteristics, and it is something that is difficult to change. Sarri realising why Mourinho and Conte didn’t last. Too often Chelsea players phone it in, including the darling prince of Belgium. Managers haven’t been Chelsea’s problem for a long while. "It could take quite a long time but it could be changed by a new player coming in or perhaps by one of the old heads in the team assuming responsibility and driving the team forward." It was a disappointing night for the club as well as the fans, and Sarri will be looking for a much better performance from his players when they host Tottenham in the second leg of their Carabao Cup semi final on Thursday night.